A couple of Horsham trialists impressed in their opening pre-season friendly on Monday night with the club also closing in on signing a goalkeeper. The Hornets ran out 2-0 victors over neighbours Horsham YMCA in both side’s first friendly outing of the summer. 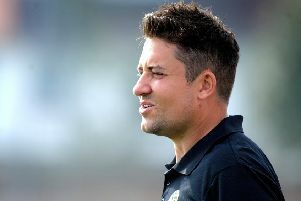 Horsham manager Dominic Di Paola was casting his eye over a number of possible additions to the squad and was impressed by some of what he saw. They are yet to sign a goalkeeper for next season but played both Josh Pelling and Brannon Daly, who is returning from his knee injury last season, for a half each against YM. Former South Park man Dean Lovegrove also played a part along with another Sparks defender. Ex-Crawley Town midfielder Ryan Richefond was also used along with a former Burgess Hill Academy striker. The club are keeping their cards close to their chest regarding the last few potential additions to the squad and Di Paola said: “It was a good workout, everyone worked hard. “There were a few trialists and one or two did themselves some good. We will let a couple of lads go this week, but a couple we will keep with us. “It has given me some real questions. One lad who I didn’t think would make it, really impressed me. With the squad’s latest additions being George Landais, Steve Metcalf, Tony Nwachukwu and Scott Kirkwood (see page 75), Di Paola is pretty much satisfied. But there could be another unexpected addition this week. Di Paola added: “Generally, we are there. Pretty much everyone we wanted to sign we have. There are a couple of others that will potentially come in this week. Some of the prominent faces from last season’s squad that won’t be returning are Curtis Gayler, Scott Harris and Hakeem Adelakun. The manager added: “Curtis won’t be coming back, last I heard he was on trial at Worthing. It’s a shame as he was one we wanted to keep. “We need people training this year. “When we get back to Horsham we want to be like every other club at this level and training Tuesday when we don’t have a game.